Spock: "We must acknowledge once and for all that the purpose of diplomacy is to prolong a crisis." This one had an intriguing and mysterious beginning. But it turned into another anvil message of an episode, and a poor one at that. But no. Almost immediately, the requisite alien babe shows up, and she keeps talking about how wonderful it is to finally be alone. 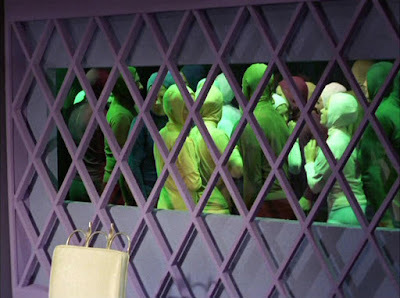 There are lots of hints that they're not really on the Enterprise, even before Kirk and Odona start seeing mob scenes on the viewscreens. Odona was a plant to make things personal for Kirk so that he would be willing to stay on Gideon forever, contributing the infectious whatever in his blood. Although why Kirk would stay because of an attachment to Odona when she was planning to die so soon made no sense. It was obvious early on that the Gideon council was being comically obdurate because they were hiding something, but choosing this particular course of action didn't make a whole lot of sense in a species that worshiped life. Yes, let's let billions of people die in agony so that we can regain paradise? And why young people instead of old? If I had been Hodin, I would have made the sacrifice myself. I certainly wouldn't have expected my daughter to do it, instead. I did like that Kirk talked frankly to Hodin about birth control issues. Although regeneration and love of life just wasn't a good enough answer for their situation. What about the Gideon-equivalent of condoms? If they regenerate so quickly, how can the deadly vegan whatever kill them? If there were that many people that no one could ever be alone and they all lived way too long, what were they eating? Couldn't have been Soylent Green if no one died. Why weren't they exploring space? If they didn't have the technology to look for other planets to live upon, what possessed them to turn down overtures from the Federation? I always wondered what happened to the Enterprise replica, too. Did they turn it into a really expensive housing development? If there were so many people, how did they make room to build it in the first place? And how did they get the blueprints, or know, say, how Kirk furnished his cabin? At least, this episode is an interesting commentary on how a self-governing people will refuse to make the hard decisions necessary to ensure the continuation of their species and their planet, certainly a situation we're familiar with today. And that brings me to the better part of the episode, which was Spock wrestling with both Federation and Gideon bureaucracy. Spock was unable to conceal his sarcasm and frustration. You'd think the son of an ambassador would do better than that. What's really shocking is that Spock and his steel trap brain didn't catch the difference in the transporter coordinates, though. That might have been the hardest bit to swallow in the entire episode. Reviewers Log, Stardate 9.17.2012 – While attempting to beam my review to Billie Doux.com, I have found myself trapped in the site. Every period, comma and all of my lame jokes and rants are here, and yet it is seemingly empty. My only companion is the third season episode of Star Trek named "The Mark of Gideon" and she is looking pretty good in her sixties era jumpsuit with dangly sleeves and pony tail. I also sense we are being watched (or possibly read) by thousands, okay hundreds, okay maybe a half dozen shut-in cat hoarders. Apparently I have been brought here to infect the series with a virus and thus allow it to die. She has explained to me that once the series was genius but its very desire to go on has turned it into a hellish mixture of cliches, recycled plot elements, and mind-bending stretches of plot holes. Bones said he could save her, but then she died a painless death of low ratings... it was sad. 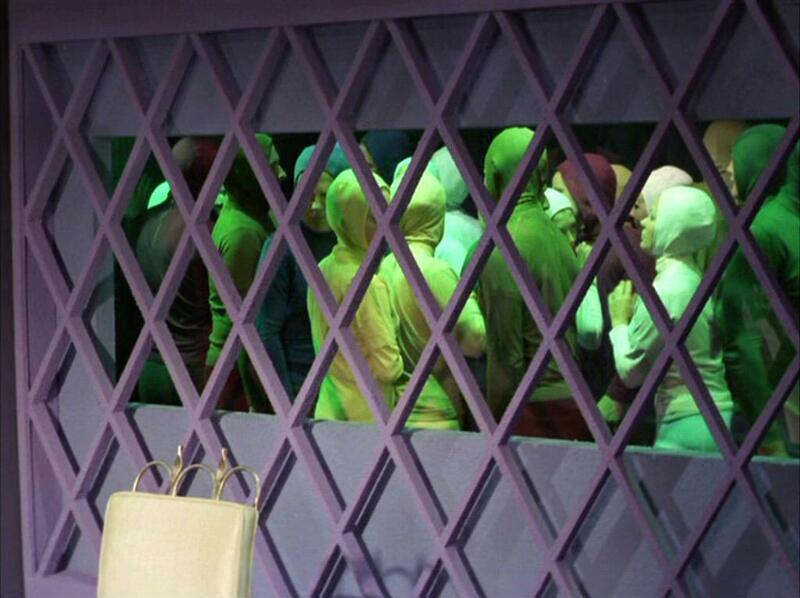 Overpopulation was the great environmental bugaboo of sixties and the idea of a planet so crowded that it descended into hell was explored in a lot of places, including far more effectively in Soylent Green. This episode wanted to tackle it (and indeed the broader theme of global crisis and collapse) and it could have been a real classic, but it was not meant to be. Re-write it like this: Kirk beams down and loses some short period of time in which they steal his blood. 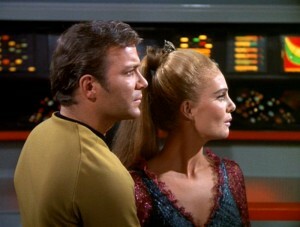 Odona is present at the negotiations, but immediately starts becoming ill. Kirk unravels the whole plot to spread disease. He has to decide to save her when she doesn't want to be saved, and reason with the government which wants to release the disease into the population. Add in the idea that it is a desperate act which the population does not know about, and you have something moderately interesting. Instead, we wander the halls of a giant replica Enterprise in a world where people are sitting three to every chair. — Stardate 5423.4, the planet Gideon. — Uhura read the coordinates to Spock. Dan remembers a song with Uhura saying those numbers. Anyone know what it was called? — The disease Kirk once had was Vegan choriomeningitis. — Odona's pink dress appeared to have a navy blue swimsuit layered on top of it. Not one of the more memorable costumes. And of course, everyone on Gideon was wearing the same thing, except for the council members. McCoy: "You mean you're going to scan space for him?" Sulu: "But sir, that could take years." Spock: "Then the sooner you begin, the better." Odona: "We're alone. Can you make it last a long, long time?" Kirk: "How long would you like it to last?" At least until she went back to Gideon and died for her people, huh? Kirk: "Odona, can you remember why your people dream of being alone?" Odona: "Because they never can be." Kirk: "Why? What makes it so impossible to be alone?" Odona: "Because there are so many of us. So many. There is no place, no street, no house, no garden, no beach, no mountain that is not filled with people. Each one of us would kill in order to find a place alone to himself. They would willingly die for it, if they could." An interesting tidbit about this episode is that it was written by actor Stanley Adams... who played Cyrano Jones, seller of that incredibly prolific lifeform, tribbles. If anyone ought to know about overpopulation, I guess ol' Cyrano would be the guy, eh?